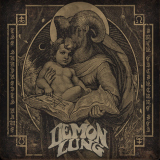 Vegas-based Demon Lung, a recent addition to the metal scene (The Hundredth Name is their first full-length) takes the traditional route when it comes to doom and polishes it. This is a good thing; The Hundredth Name, a concept piece about a quest by Satan's son to find the hundredth name of God in order to undo all of creation, is quite an impressive result, with every part of the band providing an atmosphere rendolent of huge, creeping menace with every grinding palm-mute and funereal drumbeat. This is a band that knows how to make doom metal dramatic. The riffs are unhurried and Binding of the Witch, the first track, starts quiet, fading in with guitar feedback that takes its time to resolve to a massive riff. Each one of these riffs is crushing, even the lighter ones, and the whole band appears quite happy to allow the listener to get completely overwhelmed by them for as long as it takes. Then the vocals start up. Now, female-fronted doom bands have come into vogue lately with bands like Blood Ceremony and Jex Thoth (not to mention my state's awesome Witch Mountain), but vocalist Shanda Fredrik's deep vocals don't seem to have a lot in common with their singers -- no Joplin-style blues or 70s-flavored mysticism for her. Instead, her measured delivery, piped occasionally through a filter, is bleak and monotone, a grimly deliberate wail that works magic when combined with Philip Burns' guitars. Devil's Wind and A Decade Twice Over A Day are both slow draggers, with a dreary delivery, but there's nothing particularly soft about them, while Eyes of Zamiel, a favorite of mine, is a faster, more active song with a quietly ominous verse and thudding palm-muting on the verses. With the exception of Hex Mark, which is a fairly quick song, every song takes its agonizing time and provides tons of atmosphere. The tracks chug along unstoppably, supported by thunderously heavy bass and drums and punctuated by lots of pinch harmonics, giving them a dramatic start/stop quality, which is helped by the tightness of Demon Lung's musical choreography. The final tracks, Hallowed Ground and Incantation, are great examples of this. Doom is so slow that there's plenty of room for a band to get sloppy and let the length of the riffs hide their inability to stay together, but The Hundredth Name has every thud of the drums synced beautifully with each crunching bass/guitar riff. As Incantation winds down, there is a hint of acoustic guitar in the background; even as the album fades out, atmosphere reigns supreme. Demon Lung hasn't really done anything amazingly innovative, but what they've done is finely produced and crushing. This is a band that clearly loves doom, and it shows; anyone who likes some atmosphere in their doom is going to like this offering. This is a great start to what appears to be a very promising band, and it's going to be interesting to see what they come up with next.